There's a problem with this task: I wouldn't just like to forget these moments. Many of them I HAD forgotten, at least until Lange made me dig them up (thanks a lot). It feels like cheating, but I have to mention a couple that missed the cut. Holmgren leaving Green Bay after having a street named after him was difficult to leave out, and the Brewers setting the strikeout record for a team in 2002 was something I actually witnessed in person. However, the latter is something I actually gave the team an ovation for--back then, a record was a record--so I couldn't in good conscience list that knowing what my reaction had been. Okay, enough. Lets get this over with, shall we? Reminder: the Brewers used to be bad. Really bad. So bad that when this happened, its unlikely that many of today's fans were even watching. In that infamous 2002 season--a 100 loss season, I might add--the Brewers were playing the Astros at Miller Park. Geoff Jenkins advanced from first to third on a hit by Tyler Houston, but was almost caught off third base. He hurried back and slid feet first back into the bag safely. Well, he wasn't out, anyway. Jenkins' right cleat caught on the base and everything not bone in his ankle went pop. The angle at which his foot bent was nauseating. He writhed in pain on the infield and was done for the year. It was the kind of injury that makes your skin crawl, and as such I won't subject the weak-stomached to the photos. For the brave, click here for images from the incident. Successes against Minnesota teams are always a little sweeter than the rest. Gophers, Twins, Vikings, doesn't matter--I can't stand them and love to watch my team rub their collective faces in the dirt. So when TJ Rubley took that away from me...well, he ended up on this list. 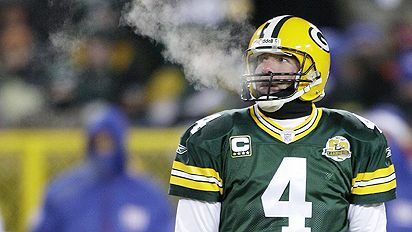 Although his starts streak remains unblemished, Favre was far from indestructable. On one particular Sunday at the Metrodome, he and backup Ty Detmer were knocked out of the game. Enter TJ Rubley, fast forward to the end. 24-24 game, less than a minute to go, 3rd and 1, Vikes 38 yardline. Field goal was maybe a stretch, but not out of the question. Holmgren calls sneak. Rubley "sees something." He calls an audible at the line, throws the ball right into the hands of Viking LB Jeff Brady, and the Vikings kick a field goal to win. In retrospect, perhaps we were all a bit harsh on the guy. 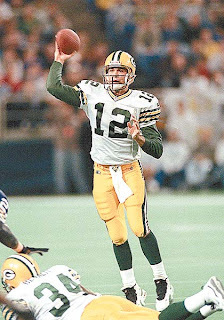 He undoubtedly had the jitters, and if that play is a completion he goes down in Packer lore as a hero. But as it stands, he disobeyed King Holmgren, threw a horrendous pick, and will forever live in infamy as "that idiot quarterback who lost to the Vikings." This one even has a Wikipedia page dedicated to it. I had somehow managed to push the play out of my mind completely. But when I saw it listed on Lange's list, it all came rushing back. 4th and 26 late in the 4th quarter and the Eagles have the ball with no timeouts. The prevent defense, Freddie "Fred Ex" Mitchell cutting through it all, McNabb running around, the lob, Sharper as always looking interception first, and the whole thing falling apart. What should have been a win went into overtime on a field goal and the Eagles won in OT. This was a failing of monumental proportions, one that essentially cost Ed Donatell his job as defensive coordinator, and wrongfully so. Bob Slowik replaced him, was terrible, and the downward spiral continued as Mike Sherman GMed the Packers right into the toilet. This was a good team, but this play and the impact it had on the team laid the kindling for the end of the Mike Sherman era. Warning: the same caution issued for the above Jenkins link goes for the video below. This ended what could have been an amazing season. Brian Butch and the Badgers were ranked #2, and were taking on #1 Ohio State in a battle for the ages, and the game was epic, with the Badgers losing by a mere point. But that's not the worst part of the game. When I saw this, I was convinced Butch's career was over. He went up for a board midway through the first half and landed hard. He then sat up screaming and the TV showed the replay. His elbow, broken and dislocated, was bent in the wrong direction. Thus ended his season. Had Brian Butch not been lost, there's no telling how the 06-07 season may have changed. They could have beaten OSU. They may have won the Big Ten. As for the NCAA Tourney...well, it hurts a little to think about that. But this was a bigger loss than the box score would indicate. Oh, did I mention it was my birthday? Yeah. Happy birthday to me. This has nothing to do with any of the subsequent nonsense that is now associated with #4. When Favre threw that pick in OT and the Giants took the game, it was like I'd been suckerpunched. The loss hurt, no doubt about that. But what also hurt was that I was finally forced to face something: Favre was old. He looked nothing like the player only a week prior. Cold gets harder to deal with as you age, and our Ironman was no different. This was the moment I realized Brett should no longer be the Packer's QB. If you're going to helm the offense in Green Bay, you have to be able to play in the cold. Its a must. Because a successful season means playoffs, and a very successful season means you're playing those January games at home. And as Favre exhibited in both this and the December Bears game in Chicago, he couldn't put the cold out of his mind anymore. So yes, the loss was tough. But coming to grips with the fact that I was ready to move on from the only Packer QB I'd ever known combined with that loss to make this a truly awful memory. Wisconsin sports fail more than they succeed. Pick up some new teams, or maybe get some better insight on real teams.